Sickle Blade From Predynastic Egypt. These artifacts were made on true blades----specialized flakes over twice as long as they are wide with geometric cross-sections and manufactured from prepared cores. In contrast to the bifacial specimens which are occasionally found on Neolithic and Badarian sites, they show very little retouch, especially in earlier times. They were composite tools, mounted in rows of five or six blades in shafts or handles of wood, ivory or bone and used to harvest grain. 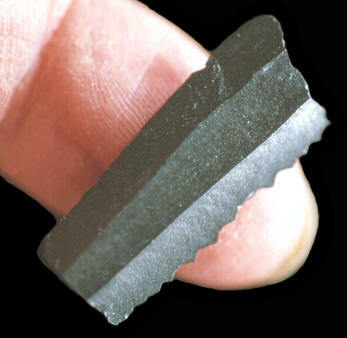 Many sickle blades bear a polish-like deposit of silicon from cutting the stalks of these grains. Recent study of Predynastic settlement lithics has shown that it is possible to date Predynastic sickle blades according to their technological characteristics. This example probably dates to the Gerzean, as indicated by the weak but intentional serration along the cutting edges. In earlier Amratian times, there was little or no intentional serration, while from the Protodynastic period (ca. 3200 - 3100 B.C.) onwards, sickle blades were carefully serrated. This sickle blade measures 1 3/16 inches (3 cm) long.